You are what you eat. True words indeed. What we eat determines our energy level, our ability to process thought, our ability to respond, longevity, and our overall health and wellness. There are many healthy additions we can add to our diet. I would like to share 4 of them that have made a difference in my health and wellness. Bone Broth: It is a source of bio-available nutrients in an easy-to-digest form. Its amino acid structure and high gelatin content makes it soothing and healing for the gut and enhances the absorption of nutrients from other foods as well. The amino acids found in bone broth also reduce inflammation in the gut. As we now know that much of our immune system is in the gut, the broth is a very important food to keep us healthy. A cup of daily bone broth is a great alternative to the flu vaccine during flu season. The vaccine has never been proven to work but has been shown to cause illness and make the pharmaceutical companies billions of dollars. Broth contains collagen, which supports hair, skin and nail health. Collagen keeps the skin smooth, firm, and reduces wrinkles. It also contains glucosamine, chondroitin sulphates and other compounds that support joint health. With the average American diet, essential amino acids are difficult to get. Bone broth is an excellent source of these amino acids. My only advice would be to make sure you are using the bones of a healthy animal to make the broth. Many recipes can be found on the internet. Check them out. Coconut Oil: I could probably write a short book on the proven benefits of coconut oil. To start, coconut oil contains Medium Chain Triglycerides (MCT’s), which include lauric acid, capric acid and caprylic acid. These acids have antifungal, antibacterial and antiviral properties that make it beneficial for immune support. MCTs are also well-known for their ability to contribute to focus and mental performance. Adding coconut oil to a drink in the morning can help improve mental performance all day. It is also good for digestive health. Its antimicrobial properties can help fight irritation and infection in the gut from a fungal infection known as Candida. So much more could be said about Coconut oil. I eat a tablespoon right out of the jar, or mix it in my morning protein shake. Give it a try to notice the amazing health benefits. Raw Apple Cider Vinegar: Wow, what a difference this had made to my health. It is full of bacteria fighting properties therefore helps keep infection at bay. The scientific evidence is overwhelming in support of consuming this powerful ingredient. It is also full of potassium and other enzymes that give you a “pick me up” and a great boost to your energy level. It has also been shown to prevent diabetes due to its ability to lower blood sugar levels. If you are taking toxic statins to lower your cholesterol, give raw apple cider vinegar a try. In studies, it has been proven to lower cholesterol levels. This is not information you are likely to hear from your doctor. Keep in mind that western medicine is more about revenue and less about healing. If the taste is too pungent, you can add it to your water in the morning or you can add it to your salad dressing. I add about 2 teaspoons to 8 ounces of water in the morning and drink it first thing. You will feel the difference after a couple of weeks of daily use. A Food-Based Multi-vitamin and Mineral: The research has shown that most Americans are deficient in essential vitamins and minerals because of our diets. According to one study from Scientific America, three-quarters of all U.S. teens and adults are deficient in Magnesium and Vitamin D. They go on to say that low levels of these essential elements lead to an increase in cancer, diabetes, and heart disease. It is also important to note that the multi-vitamin should be food based and should be in capsule form for easier digestion. I encourage all my patients to have their levels of vitamins and minerals checked when they have routine annual lab-work. It is about taking your health into your own hands. Give these 4 additions a try. Add them to your diet consistently, especially during flu season, for guaranteed results. You will remain happy, healthy, and full of energy. I look forward to hearing your stories and thoughts as you share your feedback. As always, thanks so much for taking time to read my blog. I feel incredibly blessed to be able to share my knowledge, thoughts and experience with you each week. I hope you will enter your email address and sign up to follow my Weekly Sunday Blog. Another excellent blog Vince. As a kid, my grandmother used to make us bone broth once a week in the winter months. She said it strengthened us. She used to boil the bones and vegetables, sometimes serving it as a consomme, other times as a pureed soup. However, when we were sick, it was always the clear broth that we were fed. Apple cider vinegar, this was always added to the compulsory salad that was placed on the lunch time table, as a dressing with olive oil. Coconut oil was not available in the Sudan, where I grew up, and as an adult I’ve never really taken a liking to the coconuts in any form. Keep up the excellent work. Look forward to reading the next one. Thanks as always for your response. It seems that the old timers had more knowledge about self healing. The old home remedies that we have forgotten today because we turn to a pill for everything. Again, thank you for sharing. I appreciate you. Great advice, I share this all the time. Thank you. Really appreciate your support. Thanks for the advice. I am currently taking organic Apple cedar. It works wonders. Thanks for being a reader. I really appreciate you. We can all help each other by sharing ideas. Yes, bone broth has overwhelming health benefits. I like the chicken or beef bone broth. Hope you enjoy. 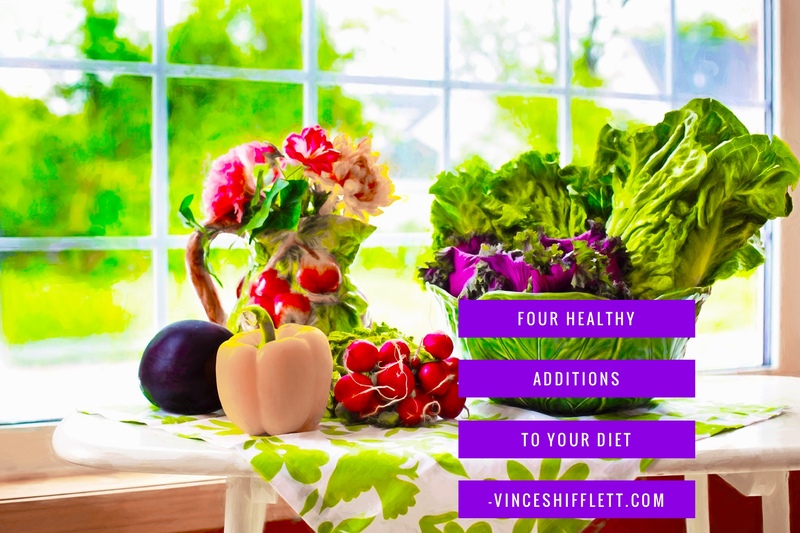 4 things that I definitely need to probably add to my diet consistently. I tried cooking with coconut oil but it really altered the taste of the food so I stopped. Guess I should find other ways to add it in, putting it in a smoothie might just do the trick! Thanks for sharing, good stuff. Yes, I agree. I also tried cooking with coconut oil and did not like the way it changed the flavor of my dishes. I either eat a teaspoon full right out of the jar in the morning or add it to my protein shake. Give it a try. do you make your own bone broth? i have never even considered it, but sounds reasonable. Sometimes I make it however I found a restuarant here in Atlanta that makes it fresh daily. They sell out everyday. The restuarant is MetroFresh. It is actually very easy to make though. Try it out. Would love to hear about your experience.